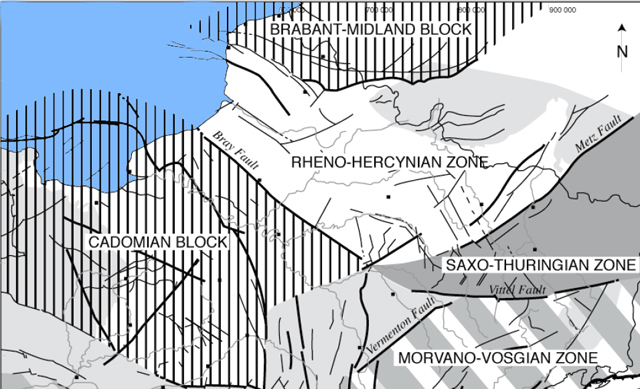 The rhéno-Hercynian zone RHZ in the North, limited to the South by the Weakness Bray-Vittel. The base of Mesozoic sediments of the NW of Paris Basin is bumped by 5 main lines of fracture which were remobilisées during the history of this pond. 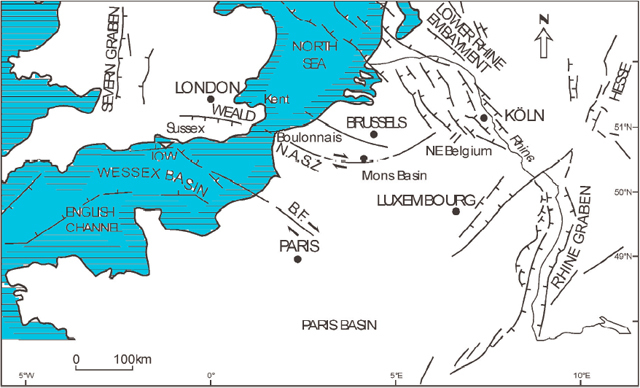 The weakness of the Seine (N150) and its repercussions southward that are the weaknesses of the Loire and Sennely (of orientation N-)). Northward, she goes on via a small weakness (weakness of Pavilly of orientation N70) towards the weakness of Manche (called on the ground Weakness of Fécamp-Lillebonne), weakness bends of global direction EW. 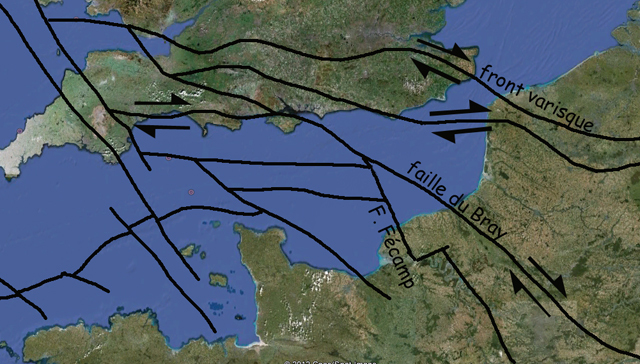 The weakness of Bray which bounds the block cadomien in the Southwest and the rhéno-Hercynian zone in the Northeast. It is the only weakness on the profile Ecors to cross the superior crust and the MOHO (Cazes and Toreilles, on 1988). It is considered as a former Hercynian dexter ductile uncoupling. This weakness is widely inverted during the terminal Cretaceous - Eocène developing a half---aanticlinal on its margin SW. The profile ECORS shows a weakness subverticale, in light pendage towards the Northeast, which would extend until Moho. She is also affected by a dexter uncoupling. This weakness goes on in the East by the weakness of Bouchy. The weakness of Bray is sismogène with for reference the earthquake of December 1st, 1769 (IIo = VI-VII; a hour = 12 km, M = 4,8-- BRGM2008). The weakness of Had, being translated in the cover by the anticlinal of Gamache. The weakness of the Somme, the accident parallel to the weakness of Bray. She is translated in the cover by the syncline of the Somme and in the crust on 30 km of thickness. This weakness was spotted in the profile ECORS of the North of France. 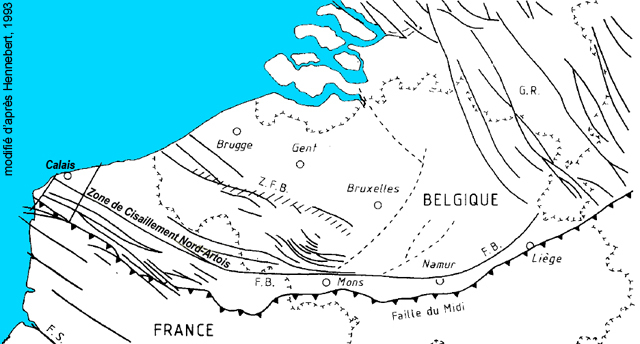 The zone of cutting the North-Artois corresponding to the forehead varisque marks the limit between the rhéno-Hercynian zone and the block of Brabant. 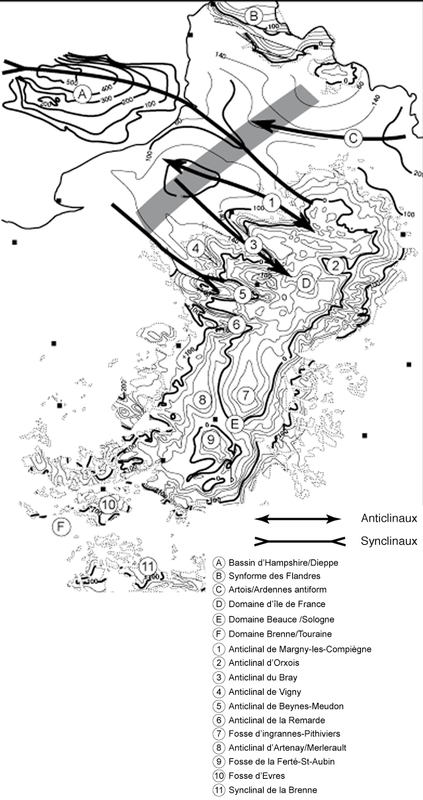 Extension of the Zone of Cutting the North-Artois, according to Hennebert, on modified 1993. On its northeast edge, the block cadomien is bumped by the weakness of Lillebonne Fécamp. This weakness individualizes a sub-block towards the SW, called block of Callus. This one plays in a differential way, either by subsiding or by heightening, during the deposit of the chalk. A context compressif settles down in the upper Cretaceous, bound to the collision of the iberian, African and European patches. He asserts itself after Turonien. The direction of the compression is N - or NE-SW. Certain number of former weaknesses, as the weakness of Bray-Vittel, react transpression there. The freshly put down cover of sediment reacts by wrinkling. They are périclines. At the level of Dieppe, the weakness of Bray do not show notorious vertical estimated rejection (maybe even set against the visible visible rejection at the heart of the Country of Bray). On the other hand, this weakness has to have a consequent, but invisible horizontal rejection because masked by the wide valley of Curve him. In the alluvial terraces and in which the intensity decreases by going away from this zone. 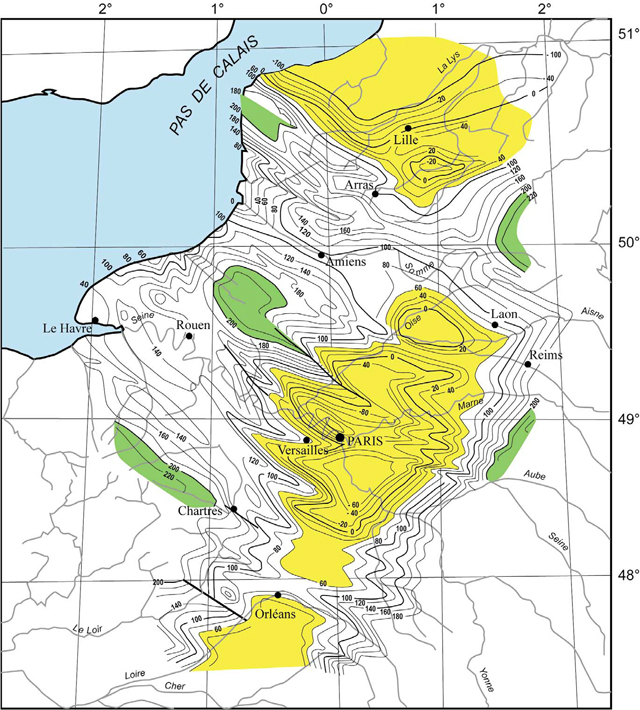 The zone faillée Vittel-Bouchy - Bray - Wight - Channel of Bristol, as well as the Zone of Cutting the North Artois, located on deep Hercynian accidents which can reach the coat replayed in the upper Cretaceous and in the Cénozoïque in horizontal cutting or it transpression. Thus that they can still be active in the Quaternary would not amaze me. I do not however know studies which approached such possible effects on the trainings subactuelles of the Country of Callus.